Painter and illustrator. 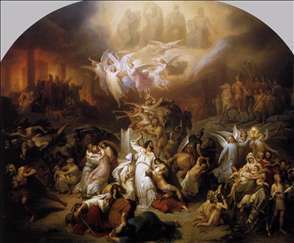 After initial instruction from his father, Kaulbach received his principal education, from 1822 to 1826, at the Kunstakademie, Dsseldorf, under Peter Cornelius. Six months after Ludwig I, King of Bavaria, had summoned Cornelius to Munich, Kaulbach followed his tutor to the Bavarian capital, where he worked on various collaborative ventures with other pupils of Cornelius, and completed his practical training on such projects as the decoration of the Odeon (destroyed) in 1826, and of the Hofgartenarkaden, from 1826 to 1829 (now painted over). More independent work followed with 16 frescoes on the theme of Cupid and Psyche for the Festsaal of the Herzog-Max-Palais (1829-35; now Munich, Neue Pinakothek), and in the throne-room, salon and queens bedroom of the newly erected Knigsbau of the Residenz (1832-35; partly destroyed). In 1835 he undertook a study trip to Venice and during the years 1835/39 to Rome. After being raised to the position of Court Painter to King Ludwig I he increasingly distanced himself from von Cornelius. Starting 1847 he also worked in Berlin on numerous commissions from Prussia s King Friedrich Wilhelm IV. In 1849 von Kaulbach was named director of the Munich Academy and began a short time later with the plans for the Neue Pinakothek s frescoes. Kaulbach, who achieved widespread popularity through his sharp, satirical illustrations to several important literary works from, among others, Goethe and Schiller, was one of the most important and successful artists of his time. Whereas the large format of Kaulbach s major works owe much to the history paintings of Carl Theodor von Piloty, his sculptural-baroque modelling coupled with restrained coloration are directly related to the Cornelius school. See more details about "The Destruction of Jerusalem by Titus"